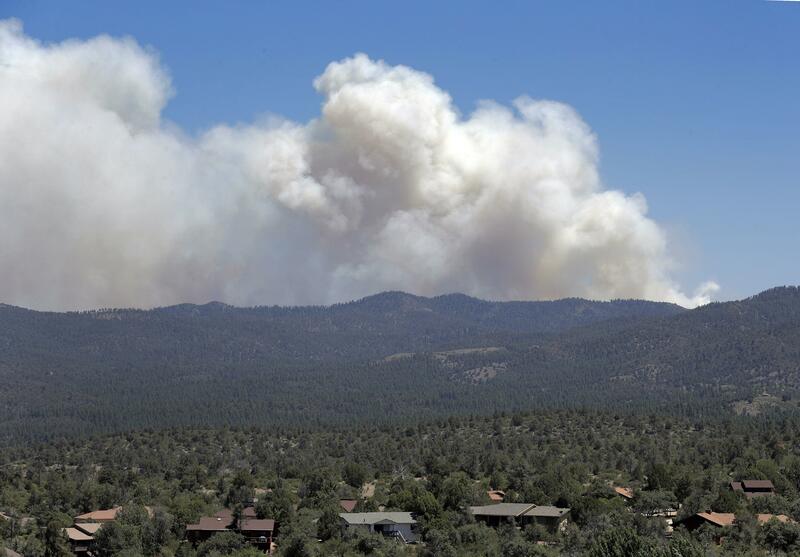 PRESCOTT VALLEY, Ariz. – A wildfire burning Wednesday through a dense Arizona forest has forced thousands of people from their homes, closed a major road and created a huge plume of smoke over the same area devastated by a blaze that killed 19 firefighters four years ago. The fire is burning in communities around Prescott, a mountain city about 100 miles north of Phoenix that draws a mix of desert dwellers escaping the heat, retirees and visitors to its famed Old West-themed Whiskey Row. The fire has charred 32 square miles while being fanned by winds ranging to 35 mph winds. “It’s scary because we’re coming up on the four-year anniversary of the Yarnell Hill fire – there’s still a lot of fresh memories,” said Arizona state Sen. Karen Fann, who lives in Prescott and represents the area where the fire is burning. In Central California, a wildfire destroyed the home of “Big Bang Theory” star Johnny Galecki on a ranch in the San Luis Obispo area. Firefighters in Washington state were battling three fires near Wenatchee that had grown to about 37 square miles. It’s also a key requirement should federal aid resources be requested. Published: June 28, 2017, 5:03 p.m. Updated: June 28, 2017, 9:11 p.m.